In simple terms, Marketing Automation is the process of using technology to automate and streamline marketing activities. It can be used for email, social media, mobile, online adverts and much more. The process of automation for repetitive tasks frees up time for strategic focus elsewhere and also gives a ‘drip-feed’ of leads for a business. When using Marketing Automation for a business website, we’re looking at what would traditionally be called a ‘Marketing Funnel’. This is the process that a visitor can go through to be educated and lead to them being presented with an offer to make a purchase. The majority of first time visitors to your website or business are not ready to buy immediately and are looking for information for their particular problem or issue. By nurturing this visitor to your website and creating communication touch points, you can educate them with quality information that is targeted towards their issue and help them to see the value in the product or service that your company offers. People buy from those that they trust. It can typically take 7 - 10 points of contact for someone to fully trust you and be ready to make a purchase. Your sales funnel should be designed to take your potential customer by the hand and lead them on a journey of education and assistance. At the end of your funnel, your product or service then becomes a ‘no brainer’ purchase for them. Setting up a Marketing Funnel and the various elements around this will give an ‘always on’ source of leads to your business. As long as traffic is coming into your funnel, you can generate leads from it. Over time the marketing message can be adjusted with testing methods to ensure you’re getting the best conversion rates possible. Another great way to use Marketing Automation is to recover abandoned shopping carts on your E-Commerce website. Abandoned carts are a common issue on E-Commerce websites. Studies have shown that abandoned cart percentages range between 55% - 80%. In other words, up to 3 out of 4 shoppers leave the site without completing a purchase. It’s very easy for a buyer to get distracted at the point of checking out, particularly if there are any hoops that they have to jump through to complete this process. If you’re not currently tracking abandoned carts and helping to recover these, you’re leaving money on the table. A simple method to recover abandoned carts would be to set up a solution that tracks customers who abandon their carts and to send them a personalised offer to complete their purchase, within a few hours of the abandoned cart occurring. There are GDPR implications to be aware of here and you should plan your E-Commerce journey accordingly to ensure that you comply with the recent law changes. In summary, Marketing Automation is one of the most important functions for your business. 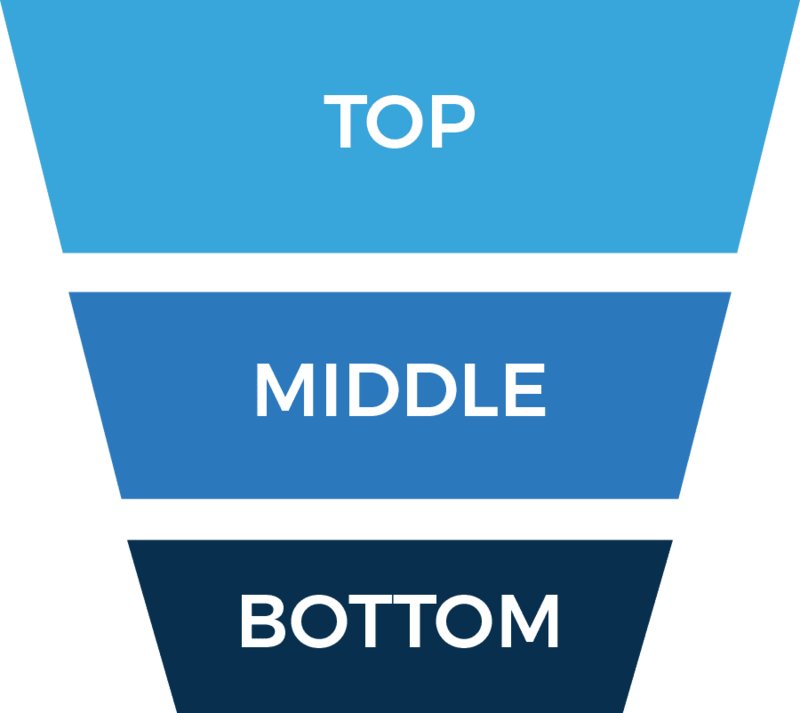 Having a quality Sales Funnel that brings traffic to your website, educates the prospect and converts them into a customer, on autopilot, is extremely valuable for your business. This is your starting point - you want to get eyes on your business. Attract visitors to your website through SEO, PPC, Content Marketing and Social Media. Offer them valuable content such as whitepapers, ebooks, checklists etc, in exchange for their contact information. These are your leads, now you need to qualify them. They’ve signed up to receive information from you and your job is now to educate them, building and nurturing a relationship and demonstrating value. Your customer is now ready to make a sales decision. It’s a simple case of asking them for their business. In an automated process, this would take the form of an offer email or a booked sales call, where you could run through a presentation and convert to a sale during the call. We’ll start your Marketing Automation project off with our Discovery stage. This is where we learn all about your business and your products or services. We’ll talk about your requirements and establish the brief for your project. During the research phase we will learn more about your perfect client and who you want to target with your marketing. We’ll look at what motivates your target audience and the type of language and content that engages with them. Following our Discovery and Research phases, we now move into creating a plan for your Marketing Automation project. We’ll look at the actions that you want the user to take on your website and plan any lead magnets with you. We’ll start setting up the funnel process, looking at: landing pages; thank you pages; upsells; lead magnets; nurturing emails and more. This is where the magic starts to happen and your new marketing project starts to take shape. We’ll review and test your new marketing funnel with you, showing you how the different steps work and how tags are applied to subscribers. We’ll carry out any further tweaks to the project, getting it ready to go live once approved. We’ll help you to launch your new marketing automation funnel and it’ll be ready to start receiving traffic from interested visitors. We’ll work with you to continue to optimise your marketing funnel and deliver traffic to it via digital marketing. Matt helped with our sales process and how we turn visitors into customers. I loved learning about “content upgrades” and how valuable these can be when added to our blog posts. We worked with AntiSushi to engage with our customers on an ongoing basis. They helped us to setup a system to recover abandoned shopping carts, which has brought in extra sales, plus we re-engage with customers every 6 months when their water filters need replacing. Matt and his wonderful team at AntiSushi have helped us to generate more sign-ups for our online courses, both free and paid. We now have a great system for new visitors, to help educate them on the benefits of working with us.